US Secretary of Defense nominee labeled Netanyahu “a radical,” called to include Hamas in negotiations. 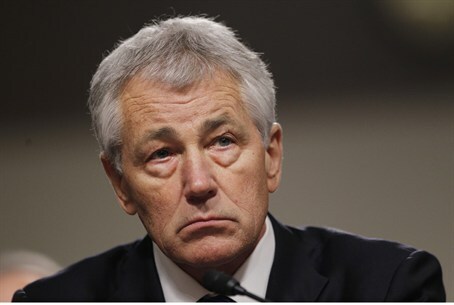 Those concerned by United States Secretary of Defense nominee Chuck Hagel’s views on Israel saw another reason to fear with the publication on Wednesday of Hagel’s statements from a 2010 meeting with university students. Hagel’s statements were revealed by a student who was present at the event. Former student Kenneth Wagner shared an email he wrote during Hagel’s talk with the Washington Free Beacon. “He said that he [thought] that Netanyahu was a radical and that even [former Israeli Foreign Minister Tzipi] Livni, who was hard-nosed thought he was too radical and so wouldn’t join in a coalition [government] with him. … He said that Hamas has to be brought in to any peace negotiation,” Wagner wrote. “It was probably the most negative thing I’d ever heard anybody in elected office say,” he told the Washington Free Beacon. He has also been criticized for his position on Iran’s nuclear program. Hagel has backtracked on some of his comments. He said his condemnation of America’s “Jewish lobby” was “a very poor choice of words.” He has denied having claimed that Israel controls the U.S. State Department.